Barganing is a way of life in Bali. A skilled barterer will spend half the money on souvenirs that an unsuspecting shopper will (and get laughed at for it afterwards). I’ll teach you to tango with your shopkeeper to get the most bang for your buck and avoid getting the bule price. Step 1. Bargaining is 50% location. If you choose a main vein tourist street, you aren’t going to be able to get a fair price. Choose a store just outside of the main streets filled with tourists happily shelling out cash like… well, like tourists. Choose one offering a variety of items that you might want. Step 2. Browse around for a bit and then focus in on one thing you like.The key in this first step is not to look too interested in the item when you casually inquire the price. Step 3. 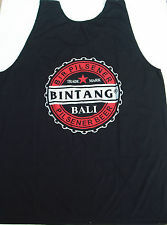 The next step is to laugh off the first price you’re offered (Laughing is also a way of life for the Balinese, so this won’t be rude) then aim for a third to a quarter of the price that you are initially offered when your real expectation should be to get it down to about half. Don’t get discouraged, it may take a couple tries to get a lower price, so hold fast. You can even tell them that a nearby shop is offering the same thing cheaper. Step 4. Shop some more! This is why you chose a shop with variety. Once you’ve successfully bartered for one thing, you’re far more likely to start hearing the real prices of things when you ask the shop keeper. If something sounds inflated, try steps 1-3 again. Learn a little Indonesian from a phrase book or online to do this, and you’ll be golden. 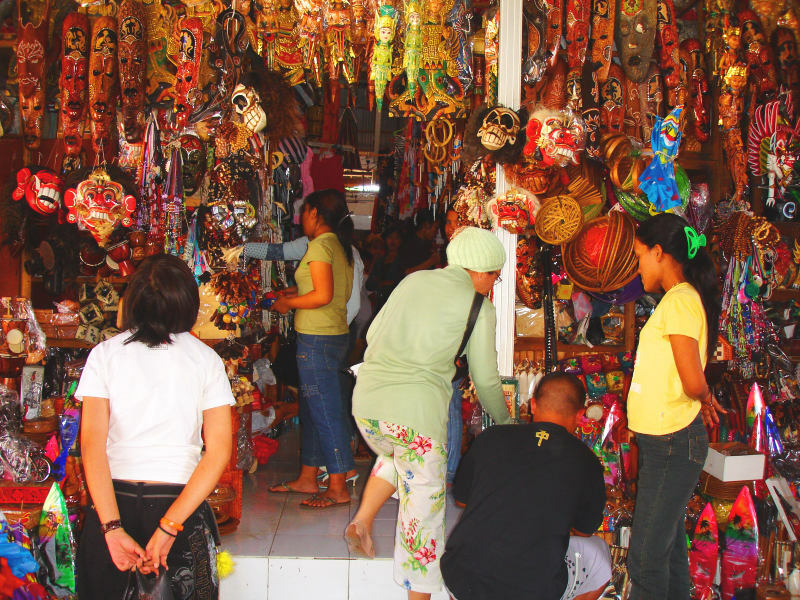 It’s important to barter in Indonesian rupiah even if the store keeper tells you the price in dollars. Also, if the shopkeeper is unwilling to engage in negotiations, move on and try your luck elsewhere. I promise you that you’ll be able to find the exact same thing somewhere else. 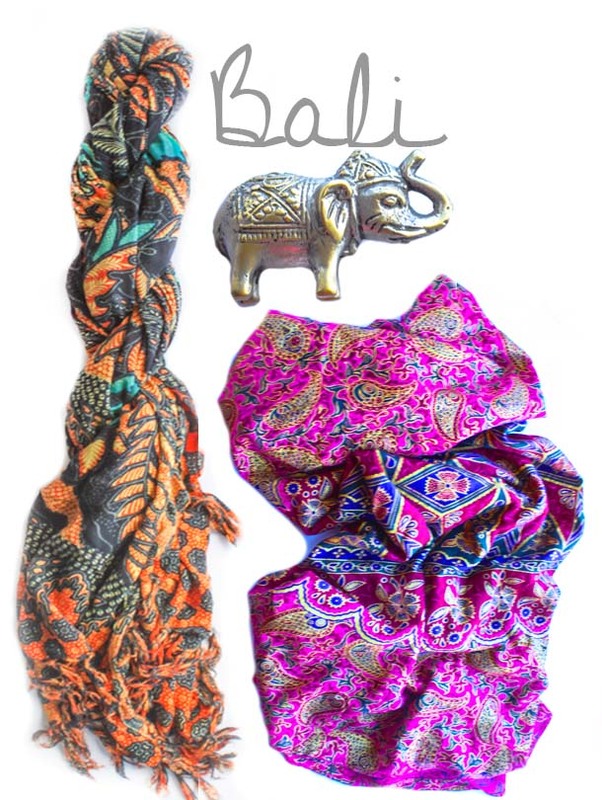 Sarongs: 50k Rp for large patterned material with finished edges, 25-30k for ones with tassel or tied edges. Elephant Trinkets/ Carvings/ Mosaic: starting at 30k Rp for something pocket-size, 70- 100k for something bookend sized and up for larger. Bracelets: starting at 10k for simple leather braided or tied bracelets with beads, for silver aim to pay 100k+ but be wary of the actual quality. Tote Bags/ Clothing: half of the initial price should do. 40k to 60k for most beach tanks, shorts, harem pants, and jumpers. 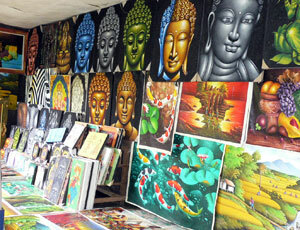 Paintings: 150k to 400k depending on the size. Most paintings are mass produced, so be skeptical when you’re told that it was someone’s masterpiece. Bartering can be awkward at first, but it’s a way of life in many countries, and if you’re traveling on a budget or are aiming to stretch your money a little further it’s one of the most useful skills you’ll learn. If you just can’t seem to warm up to barganining, don’t worry, you can avoid it by going to the huge fixed-price souvenir warehouse in Kuta before you leave: Geneva Handicraft, at Jalan Raya Kerobokan No. 100, Kuta, Bali. Although you may be sacrificing the cultural experience, some quality, and variety here.